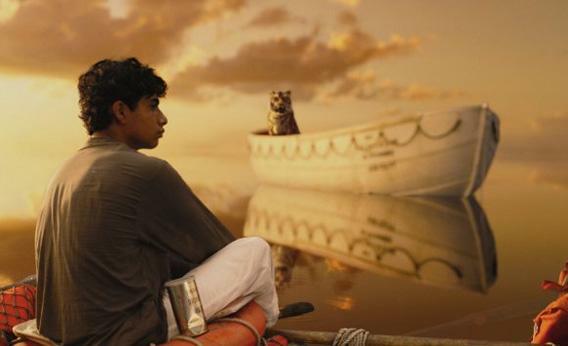 Life of Pi is a great film, worthy of all the recent award nominations. The visual elements and the story itself are captivating. However, what sets the movie apart is the message that we can choose the “truth” we want to believe about reality. The story is an incredibly creative display of that philosophical perspective and also a challenge, perhaps on a personal level. Through the use of great story, the audience is brought to a place of making a choice about how we interact with reality. In some ways, the film exposes the truth of how postmodern humanity defines reality as much as it touts that philosophical perspective. The movie tells a fantastic tale of survival in which a teenage boy, Pi, survives on a raft with a tiger for months and months after a shipwreck. The raft initially has several animals that all end up killing each other, leaving just Pi and the tiger. The story includes many fantastical elements that are just too much to actually believe such as an island that is “alive” and a survival guide that describes how to tame a tiger. The story telling device features a writer interviewing Pi as an adult years after his survival. Toward the end of the story, Pi describes that after his rescue he was interviewed by the insurance company which had insured the sunken ship. He tells his incredible tale of survival and they refuse to believe him. They press him for the “truth.” Finally, he tells them a much more gruesome tale where the animals who were killed were actually people from the ship. The bloody story was simply horrible and savage and depressing as opposed to the terrific, heroic tale that is the narrative of the film. Pi relates that the insurance company decided to record his first story after hearing the bloody, murderous tale. The philosophical challenge is simple: is truth simply a function of what we prefer? For example, Muslims prefer a god named Allah and the Hindus see god existing as millions of gods and Christians prefer Jesus. Is that really how truth works? Or, is that how we prefer truth to work? In no other realm of human knowledge is preference allowed to dictate what is true. Perhaps, no other realm of human knowledge is as consequential or therefore as personally challenging as what we believe philosophically about the nature of life and spirituality. Perhaps, this is why we play by different rules. The personal challenge is crucial: do I believe what I prefer to believe or seek truth no matter the perceived consequence? “There is a way that seems right to a man, but in the end it leads to death.” My perception and my preference may not be in line with reality. So, if I simply go with my preference and perception, I could be moving toward death. And, death, as defined by the ancient sage in this verse, is separation … separation from the God who is reality, who is life. However, if I choose to trust Him despite my perception or preference, I find life and peace and joy. It may not seem right at first glance (it might seem to conflict with life and peace and joy) but truth will always lead me there. We generally know the truth but often don’t prefer it, or we don’t know but want to settle with something so we’re not left in doubt. If we know the truth, we do well to trust and hold on tight. If we don’t know, we do well to let doubts and uncertainty keep us on the humble quest. Worse than the pain or discomfort of truth and doubts is the “death” that comes from simply settling for preference. Thanks, Pi, for the beautiful story and the reminder that truth is not always what I might prefer but its always what I need. ~ by Ted Wueste on January 19, 2013.